Siberian huskies are working dogs, bred to pull hard in cold climates. Huskies have a friendly disposition but they are energetic and intelligent dogs and can get into trouble if bored and left alone in a house all day. A crate will keep your dog safe from chewing things like electrical cords and your couch, or digging a hole in your carpet when you cannot be around to supervise. Consider it the same as a playpen for a baby. It is also an invaluable tool in housetraining. Puppies learn from their mother that they shouldn’t soil their sleeping area. When they are still in the whelping box, the puppies will crawl away from their sleeping area to an area they chose as the potty area, and eliminate there. They are already innately trained not to soil the area where they sleep. Usually the need to crate your husky is only a temporary one until they are potty trained and have stopped chewing on inappropriate things. The key to crate training is teaching your dog to love the crate and use it as his den. It should be his toy box and contain his favorite things. 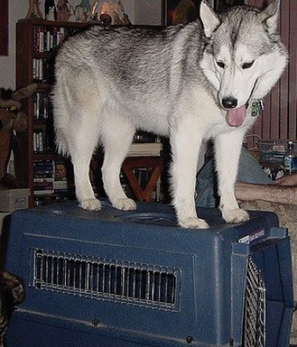 Obtain a crate that is large enough for your husky to turn around in and stand up comfortably in. If it is too big then puppies are likely to go pee in it because the crate will be big enough for them to establish a “toilet” and a “bedroom”. We have good success with the ‘airline style’ transport crates as huskies cannot destroy the wire like they can with the more flimsy collapsable style crates. Place blankets or a dog bed in the bottom of the crate for your dog to sleep on. Your dog may chew and shred his bedding, if this is the case then use an old blanket or towel so that the cost of replacing them is minimal. If it is hot then your husky may prefer to sleep on the cool plastic of the crate floor. Provide a small water dish in the crate with fresh water. If your dog plays in the water and tips the bowl over then use the type of water bottle that attaches to the crate's door and releases water when licked, If your husky is going to be left in the crate for a couple of hours or over night to sleep, it isn’t necessary to leave food in the crate as well. Access to water and chew toys is a must though. Don’t leave rawhide bones in the crate, your dog should always be supervised when eating bones. Many can splinter or become "gummy" and spongy and can get stuck in the back of dogs’ throats, creating a choking hazard. Place the crate itself in a room that has a lot of activity or is near where you spend most of your time. Put toys that are acceptable for the dog to chew on unsupervised in the crate. Your Husky needs to think of his crate as his special place. Lots of fun stuff should happen in it. Feed your dog in the crate, leave the door open so he can go in and out as he pleases. Keep his toys in the crate so he thinks of it as his toy box and heads into it to grab his squeakies. Drop bits of kibble or treats periodically into the crate. When your dog goes into the crate to eat them, praise him. If your dog goes into the crate before you have dropped a treat, even better. Start closing the door as your husky goes into the crate to eat the treats. Repeat this and increase the duration of each session by a few seconds. If he whines or barks, do not reward him with attention, and try not to open the crate in response to his protests; instead, wait until he’s quiet to praise or release him, Husky’s are vocal dogs with a stubborn streak so don’t panic if your dog begins to howl, scream and fuss, you are not hurting or being cruel to your dog by making him go into a crate. Keep calm, you do not want to punish your dog for making a fuss or he will begin to see the crate as punishment and not his special den. Stay in the room while you are counting and your dog is in the crate. As he is able to stay closed in for longer periods, wander around the room a little so he gets used to your movements while he is closed in. When he is calm for one minute while you are in the room, try leaving the room after you have closed him in. When your husky is comfortable staying alone in the crate while you are in another room, you can graduate to actually leaving the house for a few moments. Give your husky a frozen stuffed kong to chew on to act as a fun diversion for him when you leave the house. He will focus less on your departure and more on the good things he gets for going in. Increase the amount of time you are out of the house. The speed at which you increase the duration will depend on your dog's comfort level. If he seems relaxed or sleepy, you can leave him for an hour or two at first. If he still is uneasy, you will have to leave him for only a few minutes at a time. Many people find it helps to leave the radio on for their pups...I know that I have been guilty of leaving the animal planet on so my dog could watch tv! Take your puppy or adult dog on a long walk or have a long play session before putting him in the crate when you will be gone for a long period of time. Huskies have a lot of energy and will need to expend it before they will relax in a crate. Make sure you let your dog pee or poop before closing him in the crate for a long period. Never crate a dog with a choke collar on. Dogs can choke themselves to death. It’s a good idea to remove any collar while the dog is in the crate.